The British pub is a social arena like no other: a place of both conflict and comfort – rivalry and camaraderie – and where all troubles can be washed down with a pint of ale. Gaming has always been integral to the pub scene, since it too creates bonds and breaks the monotony of daily life. But don’t think it’s always been backgammon or tiddlywinks… There’s a dark, and often violent, history behind some of London’s longest-standing watering holes. Today pool and darts are the most popular bar sports, but back in the 18th and 19th centuries it was games like skittles (an early version of 10-pin bowling) and cribbage (a popular card game) that were the favourites to play. If you wanted to get an idea of what it was like, a skittles alley still survives in the basement of the Freemason Arms (www.freemasonsarms.co.uk) near Hampstead Heath, but of course patrons are no longer permitted to play for money. Gambling became illegal in public houses with the Betting Gaming and Lotteries Act 1963, but a number of British pubs still display evidence of the rich gambling culture that used to exist. The Queens H ead in Piccadilly (www.queensheadpiccadilly.com), for example, has an old photograph hanging on one of its walls displaying an assembly of hatted gentlemen and their dogs. Don’t be misled by the refined composure of the scene though, this pub used to be the setting for ratting – a grisly contest where bets were placed on how many rats a dog could maul within a certain time. 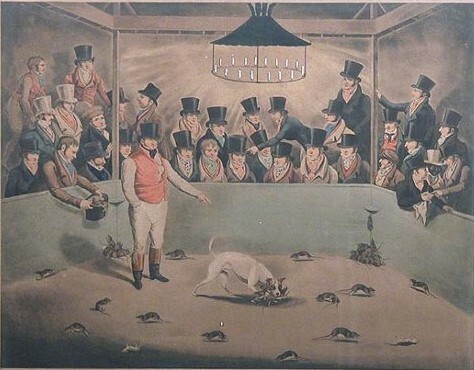 Around the mid-19th century, gentlemen and commoners alike (known collectively as ‘the fancy’) would gather in pubs like The Queens Head to watch the most ferocious dogs fight it out in the rat pit. A notorious bull and terrier called Billy is reputed to of killed 100 rats in 5:30 minutes – that’s one every 3.3 seconds! Eventually towards the end of the century, with indictments led by the Royal Society for the Prevention of Cruelty to Animals (RSPCA), rat baiting was eradicated and The Queens Head refashioned itself as a meeting place for pedigree dog owners (hence the picture on the wall). Interestingly, this meeting place for gentlemen to exhibit their dogs soon evolved into the society that founded Crufts. A number of seemingly innocent London pub names have a much darker history to them. 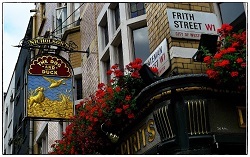 For example, the animals on the sign of The Dog and Duck in Soho(www.nicholsonspubs.co.uk/thedogandducksoholondon) may appear to be friendly, but in fact the pub name references another ugly blood sport: duck baiting. This involved releasing a pinioned duck into a pond, so that it is able to sit on the water but not fly away. A dog would then be let loose into the pond and bets would be placed as to how long it would take the canine to catch the duck, whose only means of escape was to dive under the water. George Orwell was a famous regular at this pub – could its name have provided any inspiration for his allegorical novella ‘Animal Farm’? Probably not. Humans themselves were also integrated in the culture of bloodletting for money, with bare-knuckle fighting being commonplace in a number of establishments. The Lamb & Flag (www.lambandflagcoventgarden.co.uk) by Covent Garden developed a particularly brutal reputation for pugilism, even earning itself the nickname ‘The Bucket of Blood’. Gambling at this time was a dangerous business, as stakes were extremely high. A culture that prized honour and reputation above all else inevitably resulted in a number of cheap and violent deaths. The Grenadier pub (www.taylor-walker.co.uk/pub/grenadier-belgrave-square/c0800) in Belgravia is said to be haunted by the ghost of a subaltern from the Duke of Wellington’s regiment, who was caught cheating at cards and subsequently beaten to death by his colleagues. For those members of the landed gentry in 1800s, gambling wasn’t so much a matter of life and death but instead a fashionable form of conspicuous consumption. Whereas the poor working classes were confined to gambling in London’s ‘copper hells’, the aristocracy were permitted to spend their extensive disposable incomes in clubs like Whites’ and Brooks’, known as ‘golden halls’. Gambling is a rich part of London’s cultural heritage, at the same time horrific and ridiculous. This writer is certainly glad that all of the more violent games have been lost to history, but perhaps wouldn’t mind seeing skittles make a comeback.